Called by H.L. Mencken, "one of the few economists in history who could really write," Henry Hazlitt achieved lasting fame for this brilliant but concise work. He wrote it just as he was leaving the New York Times as editorial writer. His experience there, especially with the other staff and editors, convinced him that there was a crying need for an introduction to the proper way to think about economics. The result was what is probably the biggest selling economics book of all time. In it, he explains basic truths about economics and the economic fallacies responsible for unemployment, inflation, high taxes, and recession. 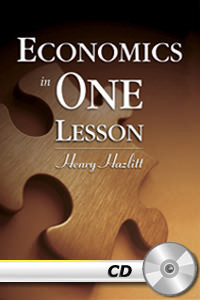 Covering considerable ground, Hazlitt illustrates the destructive effects of taxes, rent and price controls, inflation, trade restrictions and minimum wage laws. And, he writes about key classical liberal thinkers like John Locke, Adam Smith, Thomas Jefferson, John Stuart Mill, Alexis de Tocqueville and Herbert Spencer. Outstanding examples and explanations! Provides a very clear picture of the disasterous policies that are being (and have been) implemented in the United States. Economics as it was taught at the University that I attended in the 60's was totally Keynesian. There was no attempt to present any alternative approaches to the subject. I congratulate the Mises Institute for shining the light on an alternative view.